After the National Gallery of Victoria opened in 1968 as the first stage of the Victorian Arts Centre, attention turned to the completion of the remainder of the complex. This included a concert hall, theatres and spire, which had all been conceived by Roy Grounds in his original master plan in 1960, as one building, under a spire, and linked to the gallery via a covered porch. He died before seeing the final completion of this project which he began in 1959. The site selected for this complex, just south of the Yarra, was first proposed in 1943, proclaimed in 1957, and construction of the gallery component finally commenced in 1962. A competition was not held for the design of the Arts Centre and in 1959 Grounds, Romberg and Boyd were appointed architects. In awarding this commission, emphasis was placed on Grounds thirty years of experience and he subsequently became responsible for the job. He then devoted much of his time, from the 1960s to the 1980s, to this building complex. The rectangular gallery building was constructed to the south of the selected site in St Kilda Road, a triangular art school constructed to the west in 1970, and the area to the north, known as the North End, was allocated to the theatre and concert facilities, located under a circular spire. Nine years after producing the master plan, and with the gallery complete, Grounds turned his attention to the design of the theatre and concert facilities. Initial plans had been for a new gallery building and a multi-purpose auditorium, however plans for the auditoria components grew, and the State government was persuaded to annex land all the way to the Yarra. The design for the State Theatre was altered to accommodate 2000 patrons and concerns over the implications of structural works associated with underground proposals, particularly after the collapse of the West Gate Bridge in 1970, forced Grounds to look at alternatives. The Theatres Building was modified and extended above St Kilda Road level as an undistinguished bush-hammered concrete building, and the spire, lifted to house the flytower, became an enormous latticed space frame. The Concert Hall, also originally intended to be underground, became a massive, sandstone coloured precast panelled, cylinder. As a result, Ground's initial concept for the complex was greatly compromised. Responsibility for the project lay with the Building Committee, established in 1956, and comprising a number of representative members from the community, local councils, regional Victoria, the Victorian Government and the National Gallery of Victoria. These included Kenneth Myer, who was chairman from 1965 to 1989, Professor Joseph Burke and later Professor Margaret Manion from the Fine Arts Department at Melbourne University, Councillor Michael Winneke and Sir Ian Potter. For twenty five years this committee were a consistent force in the completion of the complex. It became the Victorian Arts Centre Trust in 1980, with actor and film director, George Fairfax, as its first General Manager, a position he held until 1989. Originally appointed as a technical officer, and Chief Executive Officer in 1972, Fairfax played an influential role in the development of the Arts Centre. Work began on the theatre site in 1973, with excavation work not completed until 1977-8, two years later than expected. Work on the more stable concert hall site began in 1976. As work began on the substructures, fully developed sketch plans of the buildings and their interiors were completed. Academy Award-winning expatriate set designer, John Truscott, was employed to decorate the interiors and his theatrical connections added another dimension to the project. His work on the interiors was constrained only by a requirement to leave elements already constructed, such as Ground's faceted cave Concert Hall interior, to which he applied jewelled finishes, and his steel mesh draped ceiling in the State Theatre, to which he added perforated brass balls. The lushness of Truscott's interiors, contrasted with the sombre character of Ground's exterior. The Concert Hall opened in November 1982, while substantial work remained to be done on the Theatres site. The rest of the Arts Centre was opened progressively in 1984, with the Theatres building officially opened in October that year. This signified the completion of one of the largest public works projects in Victorian history, which had been undertaken over a period of almost twenty five years. The Victorian Arts Centre is of architectural, aesthetic, historical and social significance to the State of Victoria. The Victorian Arts Centre is of architectural significance as a major work by noted Australian architect, Roy Grounds, who, together with his former partners Robin Boyd and Frederick Romberg, was one of the most influential architects of his generation, pioneering modernist design. Together with the gallery, the Arts Centre occupied much of his time from the 1960s to 1980s. Grounds significance as an architect was confirmed when he was awarded the RAIA Gold Medal in 1968 and was knighted the same year. The Arts Centre is of architectural and aesthetic significance for the high standards of design and detail evident in the distinctive interiors of the performance and ancillary spaces, designed by John Truscott. The Victorian Arts Centre is of historical significance as one of the largest public works projects in Victoria's history. This ambitious project, undertaken over a period of almost twenty five years, encompassed complex planning, design, documentation and construction phases. It has associations with prominent individuals in Victoria's cultural history including George Fairfax and John Truscott. The Arts Centre is of historical significance as a major cultural institution and as the primary focus for the arts in Victoria. Once constructed, the complex, with its distinctive spire, provided Melbourne with an important visual image. The Arts Centre is of social significance for the unusual level of public interest and support it afforded. A large number of Victorians were involved with the planning and financing of the complex and a number of major and minor corporate and individual sponsors were involved. St Kilda Road, South Melbourne. Nine years after producing the master plan, and with the gallery complete, Grounds turned his attention to the design of the theatre and concert facilities. Initial plans had been for a new gallery building and a multi-purpose auditorium, however plans for the auditoria components grew, and the State government was persuaded to annex land all the way to the Yarra. The design for the State Theatre was altered to accommodate 2000 patrons and concerns over the implications of structural works associated with underground proposals, particularly after the collapse of the West Gate Bridge in 1970, forced Grounds to look at alternatives. The Theatres Building was modified and extended above St Kilda Road level as an undistinguished bush-hammered concrete building, and the spire, lifted to house the flytower, became an enormous latticed space frame. The Concert Hall, also originally intended to be underground, became a massive, sandstone coloured precast panelled, cylinder. As a result, Ground’s initial concept for the complex was greatly compromised. Academy Award-winning expatriate set designer, John Truscott, was employed to decorate the interiors and his theatrical connections added another dimension to the project. His work on the interiors was constrained only by a requirement to leave elements already constructed, such as Ground’s faceted cave Concert Hall interior, to which he applied jewelled finishes, and his steel mesh draped ceiling in the State Theatre, to which he added perforated brass balls. The lushness of Truscott’s interiors, contrasted with the sombre character of Ground’s exterior. Work began on this concert hall, theatre and spire complex in 1973. Designed by Roy Grounds, with interiors by John Truscott, the opening in 1982-84 signified the completion of one of Victoria's largest public works projects. 1. All exempted alterations are to be planned and carried out in a manner which prevents damage to the fabric of the Arts Centre. 2. Should it become apparent during further inspection or the carrying out of alterations that original or previously hidden or inaccessible details of the place are revealed which relate to the significance of the place, then the exemption covering such alteration shall cease and the Executive Director of Heritage Victoria shall be notified as soon as possible. 3. All works shall be in accordance with the conservation policies included in the most recent Conservation Management Plan for the Arts Centre. 4. Nothing in this declaration prevents the Executive Director of Heritage Victoria from amending or rescinding all or any of the permit exemptions. The production of a approved new Conservation Management Plan or major review of the existing Plan, including the permit exemptions, shall be cause for the cessation of these exemptions. 5. Nothing in this declaration prevents owners or their agents from the responsibility to seek relevant planning or building permits from the responsible authority where applicable.
. Removal of extraneous exposed items such as pipe work, ducting, wiring, antennae and aerials, and making good.
. Repainting of painted surfaces in the same colour and quality of finish.
. Installation of heritage or commemorative plaques and the like, provided they are no larger than 0.125 sq m approximately (A3 size) and their installation does not cause detriment to the buildings.
. Relocation, removal and installation of external sculptures (except Inge Kings ?Forward Surge? or Clement Meadmore?s Whirling Dervish).
. All soft landscape works.
. All works to paving other than in the Theatres Building forecourt.
. All works to external seating.
. The installation, removal or replacement of garden watering, fire and other services to the grounds.
. All works to service vents located in the garden.
. All works to emergency fire exit stairs located in the garden.
. Removal or replacement of external directional signage.
. Installation of new signage, providing that it is of the same typeface and graphic style as the existing suite of signage and providing that it does not obscure views across the site, nor is affixed to the buildings.
. Erection and removal of the 'Spiegeltent', Sunday market, staging similar temporary structures and infrastructure, including lighting, public address systems and the like. · All non-structural works to all back-of-house areas which are not deemed to be of primary or contributory significance (eg. corridors, rehearsal rooms, including the Buckland and Band Rooms, dressing rooms, stairwells, offices, canteens, cafeterias, plant and equipment rooms, booths, kitchens, kitchenettes, bars (except bar fronts, original marble counter tops and rear walls publicly visible above equipment), loading docks, cool room areas and the like) as required. · Painting of previously painted surfaces in areas which are deemed to be of no significance i.e. not of contributory or of primary significance. · All works to toilets (including the removal or replacement of ceramic floor and wall tiles, cubicle partitions and doors, mirrors, lights, laminated linings, sanitary fixtures, fittings, equipment and associated services but excluding ?leather? and associated trim at the entrances to the toilets in Hamer Hall. · All non-structural and internal works to the Vic Cafe (except works affecting the visibility of the Graham Bennett ceilings [Deletion], the President?s (formerly Patron?s) Premier and Members? Lounges, the Vic Cafe corridors, the George Adams Gallery, the ANZ meeting room/pavilion, the Black Box, the Alfred Brash Soundhouse, the car park (including the office, cashier station and foyer) and Kings Walk. Any complete redevelopment of the George Adams Gallery would require a permit..
· Installation, removal or replacement of hooks, nails and other devices for the hanging of mirrors, paintings and other wall mounted artworks. · Installation of commemorative plaques and the like. · Replacement of like-with-like door furniture. · Installation/relocation of non-fixed furniture provided that a sample of original furniture is stored. · Re-upholstering and repair of original furniture, provided that a representative sample of original upholstery is retained. · Removal or installation of shelving and non-original built-in cupboards in back of house areas if no structural work is required. · Installation, removal or replacement of curtains, curtain tracks, rods, blinds and other window dressings. · Installation, removal or replacement of carpets and/or flexible floor coverings in all areas other than those of primary significance and replacement of like with like in areas of primary significance. · Replacement of escalators and associated mechanisms. The replacement of lift mechanisms, motors, cars and any associated elements. · Installation/alterations of exhibition lighting in all gallery spaces. Replacement of standard light fittings and tracks. · Removal of internal information, directional and advertising signage. · Installation of new and compliance signage on non-original surfaces in front of house areas, providing that it is of the same typeface and graphic style as the original suite of signage. · All works within display cases. · The installation of brochure racks on painted columns. · Replacement and installation of equipment within the stage areas, fly towers, wings and backstage areas as required. · Alterations within the orchestra pit. · Temporary installation and removal of all structures and equipment required to stage a performance. · Installation, removal or replacement of plant within existing plant areas. · Installation, removal or replacement of mechanical systems, electrical systems and equipment, switchboards, communications, hydraulics, including fire services, provided that there is no damage to building fabric of primary significance. Installation, removal or replacement of electric clocks, public address/EWIS systems, CCTV, detectors, alarms, emergency lights, exit signs, luminaires (excluding chandeliers, pendants and the like) and the like provided that original fabric is not damaged. General Conditions: 1. All exempted alterations are to be planned and carried out in a manner which prevents damage to the fabric of the registered place or object. General Conditions: 2. Should it become apparent during further inspection or the carrying out of works that original or previously hidden or inaccessible details of the place or object are revealed which relate to the significance of the place or object, then the exemption covering such works shall cease and Heritage Victoria shall be notified as soon as possible. Note: All archaeological places have the potential to contain significant sub-surface artefacts and other remains. In most cases it will be necessary to obtain approval from the Executive Director, Heritage Victoria before the undertaking any works that have a significant sub-surface component. Permit exemptions are given on the basis that the works which may be undertaken will not affect the significance of the place. The Arts Centre is a heritage place comprising two highly significant buildings, associated landscape (soft and hard) areas and a number of sculptures, some of which are individually significant. 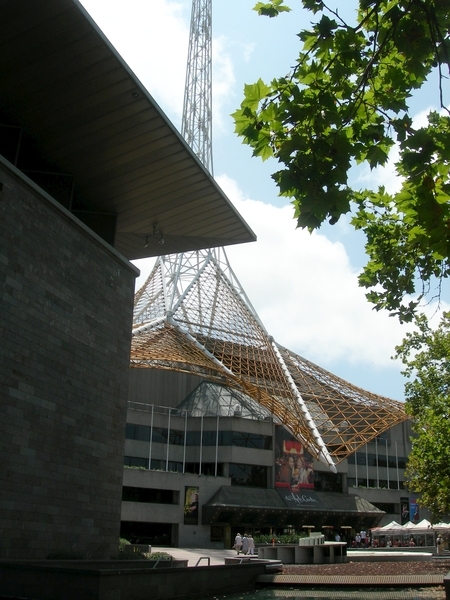 The Arts Centre has a strong inter-connection with St Kilda Road and Southbank. The building exteriors remain generally unaltered, other than for the State Theatre's Building spire from their original construction, and are of considerable significance. More recent elements have been added generally in a seamless manner and relate to the arts and entertainment functions of the complex. The building interiors are of considerable significance, being largely original, particularly in areas of primary significance. 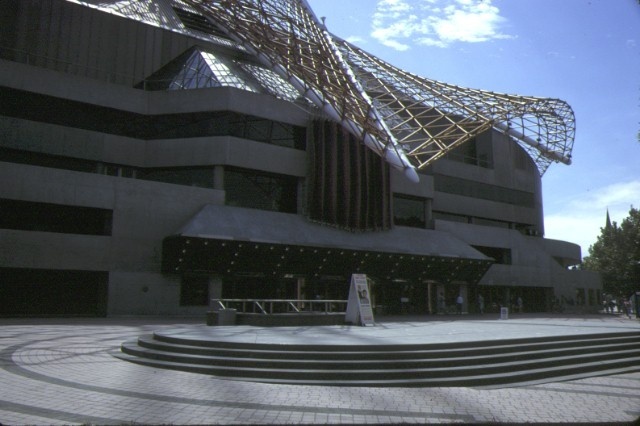 Those in Hamer Hall were inspired by the earth's geological substrate and are therefore dark and earthy, while those in the Theatres building rpresent the jewelled cavern. Care must be taken to avoid altering details or features where they contribute to the overall aesthetics of the place. The aesthetic is created from a combination of elements and finishes (including bush hammered concrete, metallic, glass, high gloss, flat,textile, leather etc), the style of door fittings, colour and patterning, or lacl of pattern, of carpets and wall cladding, textures, ornamented ceilings and walls, mirror effects, some lighting, murals and the like. Hamer hall remains to be the ugliest building in Melbourne.